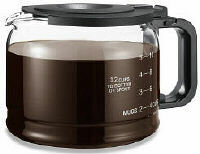 The 12 Cup Pause and Serve Carafe fits most Mr. Coffee, Black and Decker, Proctor Silex, etc. pause and serve models. This carafe is not only made from borosilicate glass but is dishwasher safe and thermal shock resistant. Adaptor is included with the carafe and does not need to be purchased separately. Carafe is available in both black & white. Height: 5-1/8", Height with adaptor: 5-3/4", Diameter of pot: 6", Diameter of base: 3-7/8"